How many of you out there in Gramblerland refer to trip adviser before embarking on a holiday? I know I do. However, I don't think it goes far enough. What if you are planning a cruise? It's all very well people saying that they have enjoyed a holiday with a particular company, but have you ever wondered how to choose the best vessel to travel on? I know I have. The answer can be found on Ship Adviser. All right, how many of you have been to a restaurant and, when paying the bill, have been at a loss to know how much of a gratuity to leave? I know I have. Well, help is at hand. You simply have to check at Tip Adviser. Here's one for the older folk out there in Gramblerland. Have you ever been advised to have a major joint replaced and not known how to choose the best one available? I know I have. Luckily for you there is a site which explains the best joints available to you. Look no further than Hip Adviser. And now one for trendies who want to wear the current fashion for torn jeans. Have you ever been unsure quite how many holes you should have in your jeans before people think you just look like a right old tramp? I know I have. Thank goodness for a site to advise on matters of such sartorial elegance... Rip Advisor. What about those of you who go in for cosmetic surgery? Have you ever wondered how to check that you are getting the best available surgery? I know I have. The answer is simple. You should check on Nip Adviser. And don't forget its sister site which specialises in advice relating to facial surgery matters... Lip Adviser. Have you ever been lost for a suitable retort when somebody makes a witty remark? I know I have. Be lost no more, all you have to do is visit Quip Adviser and hey bingo you will have the perfect riposte for those smart arsed witticisms. Musos, have you ever tried to arrange a famous king crimson guitarist's work into order of best to worst? I know I have. Well, struggle no more because help is at hand. Just head for Fripp Adviser. Have you ever wondered on the best way to shake someone's hand when you meet them? I know I have. Well worry no more. Head straight to Grip Adviser for the answer. Dirty old men, have you ever wandered around the seedier parts of a city wondering which grotty little venue has the best 'live' show? I know I have. Well avoid the risk of being arrested for loitering with intent by simply heading for Strip Adviser. Wimps, have you ever thought it would be a good idea to meet up with people even more geeky than you, just to make you look a tiny bit cool? I know I have. Well, help its at hand. Just visit Drip Adviser to find an even sadder get than you. Although, you might also end up with a plumber offering to fix your leaky tap. Readers of the greatest ill-informed blog in the world, have you ever been spoilt for choice when presented with so many wonderful links to click on? I know I have. Thankfully for you, help is at hand. A quick check on Clip Adviser will help you decide what to do. Let’s move on to grambling matters. How did we do last week? Same as the week before, unfortunately. Two horses performed as they were meant to and their winning netted us a grand total of... 81 pees. Hmm, so we only lost £1.39. What happened? Redcar - 1.35 - Collateral - 10/11 - Lost! Boo! Ayr - 1.50 - Royal Liberty - 4/5 - Lost! Boo! Ayr - 4.10 - Queen Kindly - 5/6 - Lost! Boo! Haydock - 6.30 - Mabs Cross - 5/6 - Won! Yay! Lingfield - 8.20 - Dealer’s Choice - 11/10 - Won! - Yay! As Peter Green so succinctly put it - Oh well. Onwards and upwards. What has the great and magnificent Grambler come up with this week? One for this week? Which two English Premiershit clubs were docked points in 1990 after 21 of the players on the field were involved in a brawl? As a bonus, who was the only player who didn’t get involved? One to ask them down the pub, I reckon. And finally, Cyril? And finally Esther, I am indebted to a Mr. D. Prowse who famously played Daft Ada in Star Wars, but didn’t actually provide the voice. Here is his next most famous role and, once again, his lovely Bristol accented voice wasn’t used... 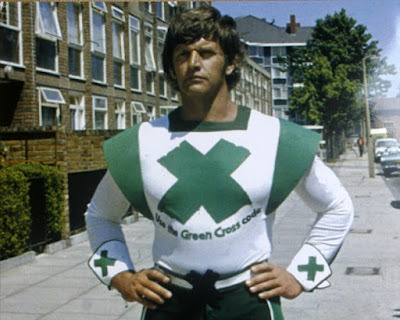 Remember, always use the green cross code. Although it was used in later ads... Is that Kenny Baker?